So let's say you come to the table with a few balls open, and at least half the remaining balls clustered so they must be moved somehow. What do you shoot first? A-Balls: Which balls on the table have logical, open paths to pockets right now, just as they lie? 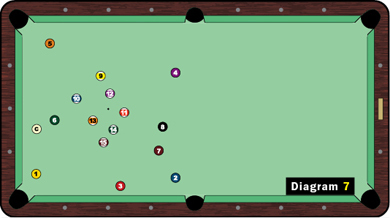 B-Balls: Which balls will have open paths - especially to the two bottom pockets, nearest where the balls were broken -once you sink one or more of the A-balls? C-Balls: Which balls simply cannot be pocketed anywhere as they lie, and therefore must be relocated somehow? D-Balls: Which of the A-balls or B-balls are you going to use to accomplish C? And then you're ready to select one of the A-balls. If you go through that A-through-D process first, you'll at least understand the nature of every ball confronting you, and you'll have separated them into those you can sink cleanly (or at least try to) and those in which you simply must send the cue ball into secondary object balls. Now, a bit on the order in which you might consider those A-balls: both the late Hall of Famers Willie Mosconi and Steve Mizerak, the dominant straight-pool players of their respective generations, took a "from the outside in" approach to position play. That means that they continually tried to connect shots that eliminated object balls nearest the four corner pockets. That way, the cue ball stayed on the periphery of the pattern, gradually closing in on the last few balls left in the vicinity of the rack. In Diagram 7, you'll see that running the balls in numerical order accomplishes just that. The player who can do that without ever sending the cue ball into a second object ball is not only well on his or her way to becoming an expert, but will be rewarded with a juicy break shot into the next frame. Most of today's better American players of 14.1 were weaned on 9-ball, and depend on their shotmaking skills to get them through racks. But straight pool, properly played, ought to be a thinking game - especially when you aren't equipped with a 9-baller's spectacular firing power. Next time you have a chance to practice 14.1, try the A-through-D method. Chances are you'll have a whole new perspective.